The fourteenth volume in the Art of series conjures an ethereal subject: the idea of mystery in fiction. 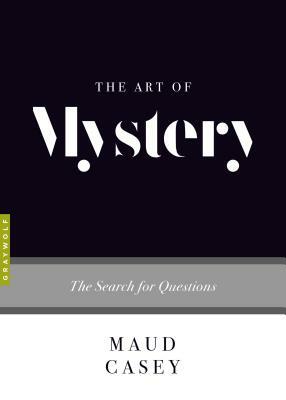 Mystery is not often discussed—apart from the genre—because, as Maud Casey says, “It’s not easy to talk about something that is a whispered invitation, a siren song, a flickering light in the distance.” Casey, the author of several critically acclaimed novels, reaches beyond the usual tool kit of fictional elements to ask the question: Where does mystery reside in a work of fiction? She takes us into the Land of Un—a space of uncertainty and unknowing—to find out and looks at the variety of ways mystery is created through character, image, structure, and haunted texts, including the novels of Shirley Jackson, Paul Yoon, J. M. Coetzee, and more. Casey’s wide-ranging discussion encompasses spirit photography, the radical nature of empathy, and contradictory characters, as she searches for questions rather than answers. The Art of Mystery is a striking and vibrant addition to the much-loved Art of series. Maud Casey is the author of three novels, most recently The Man Who Walked Away, and a story collection, Drastic. She is the grateful recipient of the Italo Calvino Prize, the St. Francis College Literary Prize, and a Guggenheim Fellowship. She lives in Washington, D.C. and teaches at the University of Maryland.